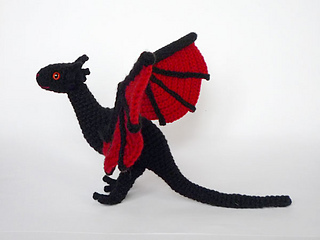 In Western mythology, dragons usually have four legs and a pair of wings. 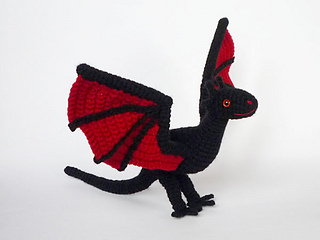 The two-legged variety (also known as wyvern) is rarely seen, but they are the ones starring in Game of Thrones. 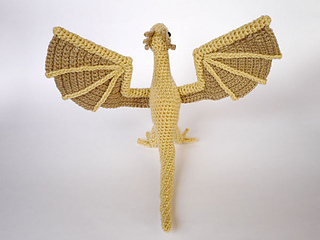 So if you’d like to feel like the Mother of Dragons, here’s a chance to create your very own fire breathing babies. 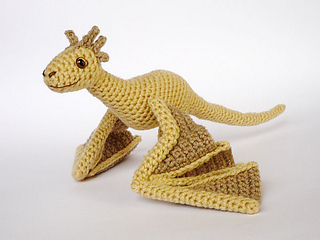 I suggest to use DK or worsted weight yarn, you will need less than a skein of a main and a contrast color. 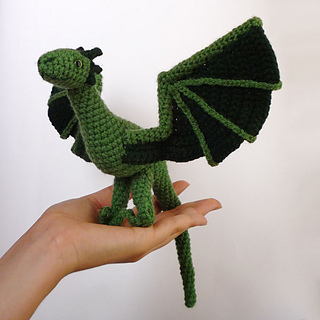 With DK yarn, finished dragons are about 25cm/10” from nose to tail tip, with 28cm/11” wingspan. 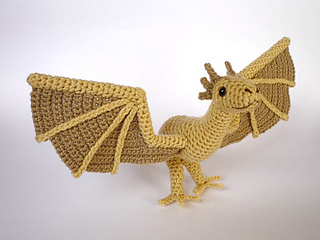 The wings are wired to make them fully posable, but you could omit the wire if the dragon is for a young recipient. starting with magic ring, chain, slip stitch, single crochet, single crochet increase, invisible decrease, 3-dc bobble. 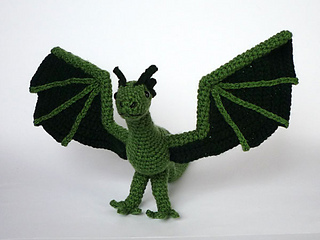 While the dragon is almost entirely worked in sc except one bobble stitch per wing, the shaping creating the curvy body form requires attention in following the pattern, making this dragon an intermediate-advanced level project.